We will recover you and your vehicle if you break down in any situation both on and off the road. Our recovery truck is able to bring you to our workshop from your location and help you get back on your journey. 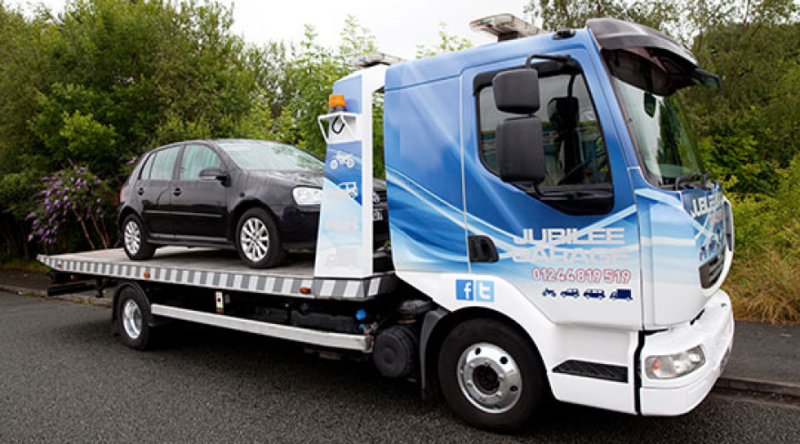 Jubilee Garage's recovery service is available to all customers from anywhere in the UK, subject to price and availability. If you need our assistance, please call us on 01244 819 519 and we will tell you the price over the telephone to come and recover you. Our driver can pick you up from the road side, private or public car parks, and even from off-road situations. We have a 4x4 recovery vehicle which can rescue your vehicle from fields, woodland and any difficult to reach area. We can recover and repair motorbikes, trikes, vans and commercial vehicles, taxis and limousines from our base in North Wales. Once your vehicle has been recovered, we can carry out any repairs needed to get it working again. All our work is guaranteed and we have access to a wide-range of parts at very competitive prices if we need to replace anything. (Put this number in your phone in case of emergencies).